In 2008, Volkswagen was again the best-selling car brand in Europe (EU & EFTA). VW was followed by Ford, Opel/Vauxhall, Renault, Peugeot, Fiat, and Citroen. Volkswagen easily maintained its position as best-selling motor vehicle brand or marque in Europe during 2008. In contrast to most other car brands, Volkswagen increased its market share despite weaker sales. Ford, Opel/Vauxhall, Renault, Peugeot, Fiat, Citroen, Toyota, Mercedes and BMW rounded out the top 10 best-selling car brands in Europe in 2008. New passenger car registrations in Europe totaled 14,712,158 cars in 2008. This was 7.8% lower than the 15,959,804 new cars registered in Europe in 2007. Of the major manufacturers, only Nissan, Mazda, and Audi managed to sell more passenger vehicles on the European market in 2008 than in 2007. Honda, Opel/Vauxhall, Seat, Suzuki, Toyota, Hyundai, and Volvo all saw sales falling by more than 10%. Some smaller manufacturers had an even worse year. Sales of Alfa Romeo, Lexus, Land Rover, Saab, and Chrysler were down by more than 20%. 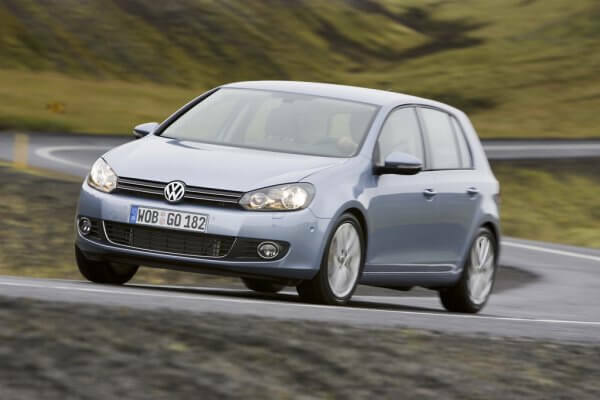 The Volkswagen Golf was the best-selling car model in Europe by easily outselling the Peugeot 207, last year’s favorite car. Of the major European markets, car sales were down by more than 10% in Spain, Italy, and the United Kingdom while Germany saw a contraction of 1.8% and in France new car registrations were down by only 0.7%. *For statistical purposes, Europe is defined as the European Union (EU27) without the very small car markets in Malta and Cyprus, plus the EFTA Countries (Iceland, Norway, and Switzerland).